This reading describes Jesus going off by himself and inviting Wisdom through deep contemplation. Jesus frequently went by himself to pray in silence. This is the role model he offers for our own relationship with God. 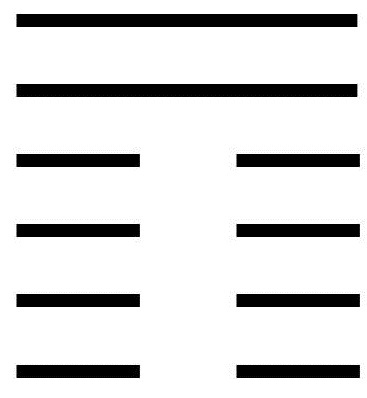 The upper trigram is Spirit, with the attribute of Penetrating. The lower trigram is Wisdom, with the attribute of Devotion. This is the image of contemplation: a deep penetration into the nature of God. In this way, we show our devotion. To gather information and cultivate wisdom in silence and deep inner concentration. To observe what is in a detached, Egoless manner. To refrain from activity, making decisions, and pursuing goals. To reconnect with the divine and mysterious presence of God. To inspire others through concern for their well-being. To reconnect with the lives of the people. To hear God speaking in the silence of the present moment. To cultivate great clarity of thought and purpose through meditation. A moving line in the second position suggests contemplation is being limited by Ego, by the tendency to relate everything to oneself rather than to understand others. For a follower, this is understandable. But for a leader, such a narrow, Ego-driven way of seeing things leads to harm. A moving line in the third position indicates one who is ready to make the transition from education to Wisdom. One is finally able to understand that the world one sees is the world one creates, and if one wants true Wisdom, one must start by creating purity in oneself. But beware! This does not mean preoccupation with oneself; it means understanding one’s full capacity to help bring about God’s kingdom on earth and acting accordingly. A moving line in the fourth position describes one who, through Wisdom, understands how to build and nurture an organization. Such a person should be given a leadership role and be granted autonomy. A moving line in the fifth position suggests self-examination. Self-examination does not mean self-preoccupation. It means examining the effects one produces. As Jesus says, “A good tree cannot bear bad fruit, nor can a bad tree bear good fruit” (Matt 7:18). One should first of all examine the fruit one is producing, and only then worry about the nature of the tree. A moving line in the top position indicates one who has completely let go of Ego, who stands outside the petty affairs of the world. Liberation from Ego leaves one fully open to Wisdom and living a life grounded in God. This way of life is the highest ideal.